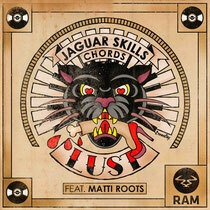 Jaguar Skills hooks up with Chords and Matti Roots for his next release, ‘Lust’, forthcoming on RAM Records. The vocal of Matti really brings light to the seasonal feel this track creates, as an arpeggio of notes underpins each high-hitting voice crescendo. Bright but not without substance, Chords’ production style is also instantly recognisable. On the flipside, ‘Break’ holds onto the A-side’s sunny disposition. The foundations laid by the producer are slightly different, as it rattles forward with clinking percussion, alluding to the kind of drop Break is renowned for. With his distinctive drum rolls and bouncy, booming and concise hits, the sound adds another dimension to the remix’s original. Monstro also offers a remix, and like the previous edit, the record’s humanism winds up within the first 30 seconds, however the impact of its drop rolls out into a house bassline that thumps with every bar. This new release from RAM is out 5 October, check it out below.